Main Forums / Other Guitar Makers / Re: The Emerald has landed. Beautiful Emerald - congrats. Yours is the same color/finish I had on mine. 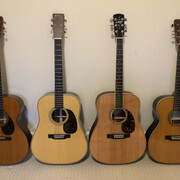 I agree - they sound very good, and more "woody" that many CF guitars. I sold mine right after Christmas this year - I didn't get along with the neck, which seems to get pretty hefty around the 7th fret... how do the necks feel to you? Between Easter and Work I have barely had time to play her. Neck seems fine. First song I played was "39". I hope I haven't committed a terrible sin by playing that instead of WotEF. Main Forums / Larrivee Electric Guitars / Re: Is this really a Larrivee? It is luvly. If our $ was par I'd be buying it for sure!! Then I would have that headstock restored - shame about that! PS Austrian, Italian and Swiss moonspruce apparently is all from the same region bordering those 3 countries (info from Larrivee Service departement). I believe so. Seems to me, it's been talked about around here before. Unusual, at the very least. Thanks for the reply! I've considered that and thought it's quite troublesome to refit a new bridge and deal with cosmetic issues if I were to remove the pickguard from a right handed, less the 01 versions. Nonetheless, I shall keep a look out! Thanks for the heads up! Main Forums / Larrivee Electric Guitars / Is this really a Larrivee? Google doesn't yield any info. Crazy looking thing, but kind of cool.